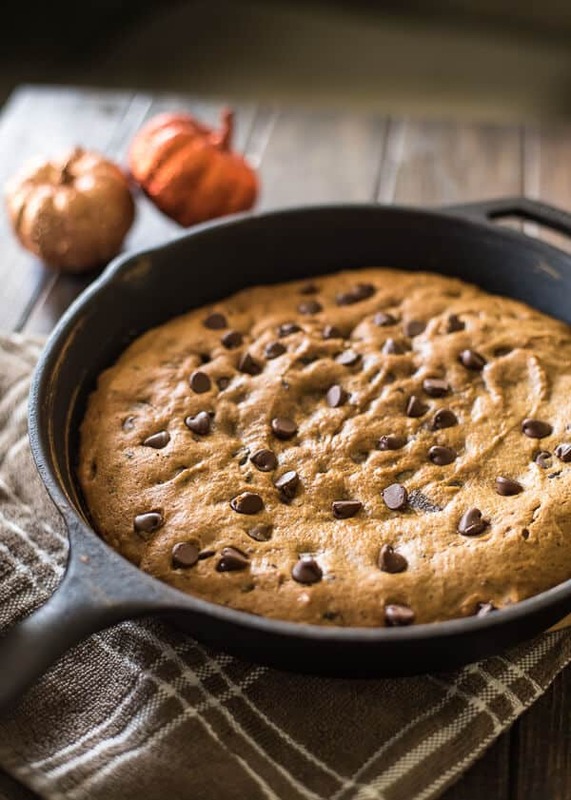 Treat your family to an easy seasonal treat – a big Pumpkin Chocolate Chip Skillet Cookie! Adding pumpkin and spices to classic cookie dough bakes up a soft, chewy cookie that you’re gonna need a plate for! Guyssssssss. It’s here!!! No one can give me grief anymore, because the time has come and I can just let it all out. I like to imagine that it happens overnight, but never at the same time of the month (though it usually coincides with the arrival of PSLs and cinnamon-scented pinecones.) A little roly-poly fairy, a la Tinkerbell, dressed all in orange flies around the world with her leaf-tipped wand, sprinkling her fairydust all over the land – except instead of fairydust, she’s spreading pumpkin pie spice through the sky. 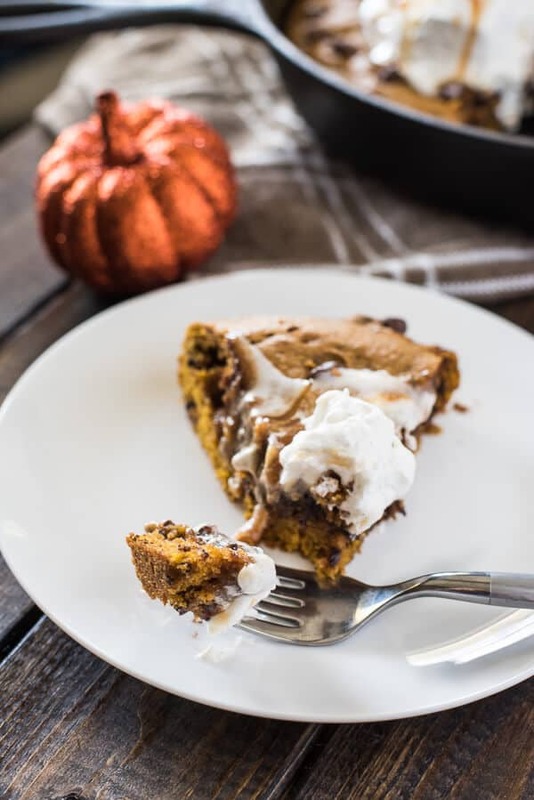 It falls on the sweet sleeping faces of the unsuspecting, and when they open their eyes the next morning, they either crave pumpkin-flavored everything or they wrinkle their noses and sneeze, ridding their bodies of pumpkin desire. It’s those folks, my friends, that become the Anti-Pumpkin Brigade. Now, I feel like I should assure you (especially if you’re a hater) that not every post from here to November (December? March?) will be pumpkin-related. A few here and there maybe, and then of course the annual Pumpkin Week next month, but I have all sorts of fun yummies in store that have nothing to do with gourds! But, for today, can you just bear with me and drool over this uh-maze-ing skillet creation? This week around the Sunday Supper table, with school starting again all over the country, we’re embracing our love of quick dinners and sharing our faaaaavorite easy skillet meals!!!! Yes, I know. A cookie does not make a meal (this is arguable.) HOWEVER. 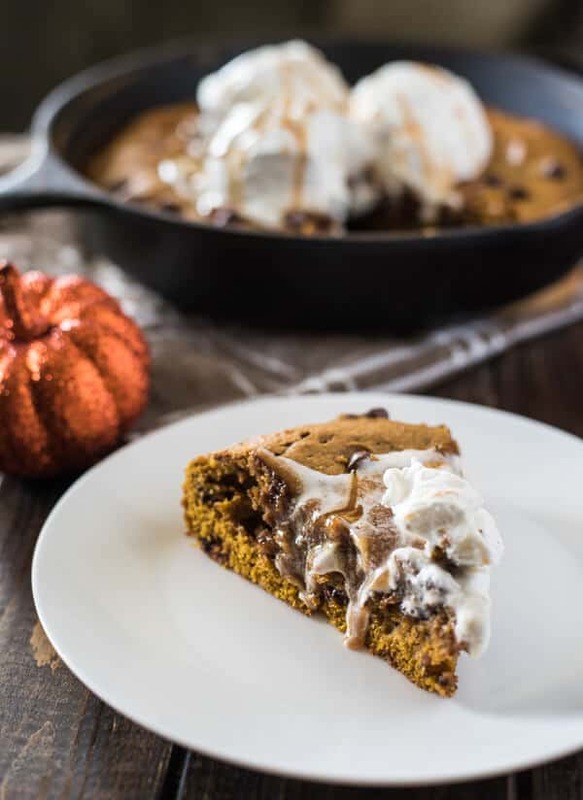 What kid (or adult, for that matter) wouldn’t want to be served a big, fat slice of soft, gooey pumpkin chocolate chip skillet cookie with a melty spoonful of ice cream on top after a tasty dinner? In a perfect world, this and a hot cup of caramel-flavored coffee would be my ideal breakfast > lunch > dinner > midnight snack. 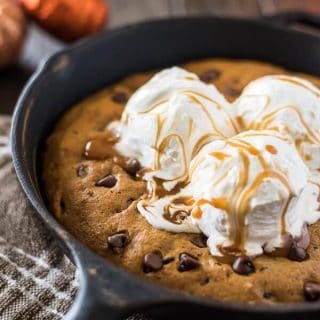 The best part about this skillet cookie? You could be eating it in about 30 minutes. Near-instant gratification for people like moi who have zero-to-little patience when the sweet tooth attacks! Plusssss: it’s a one bowl mix. Total heart-eyes over here. I can hear some of you discerning pumpkin fans already. Um, Erica? Didn’t you make pumpkin chocolate chip cookies last year? Guilty. Good eye – this recipe is verrrrry similar, minus the pecans and a bit of flour. But why mess with perfection? It’s a tried and true winner already, and super duper easy. Besides, it bakes up like a cake, it’s stuffed full of chocolate, and it’s up to you whether or not you attack it with a fork. So there. It’s different. Just don’t forget the ice cream. 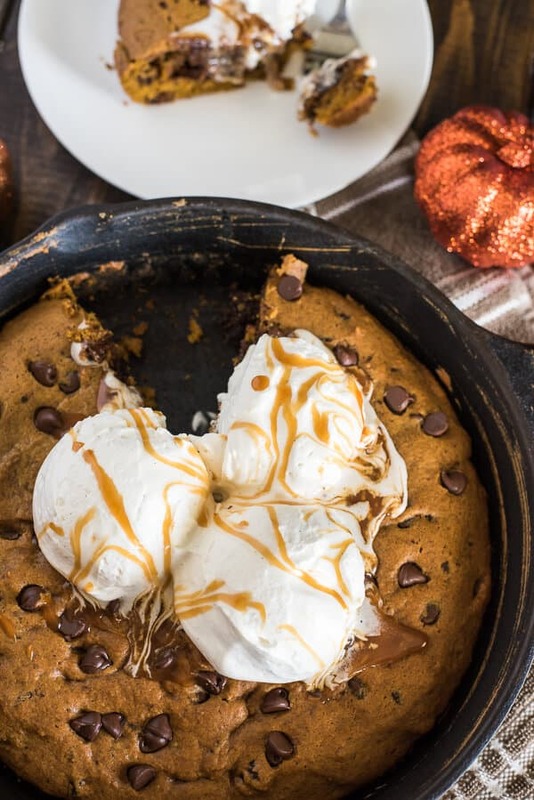 Treat your family to an easy seasonal treat - a big Pumpkin Chocolate Chip Skillet Cookie! 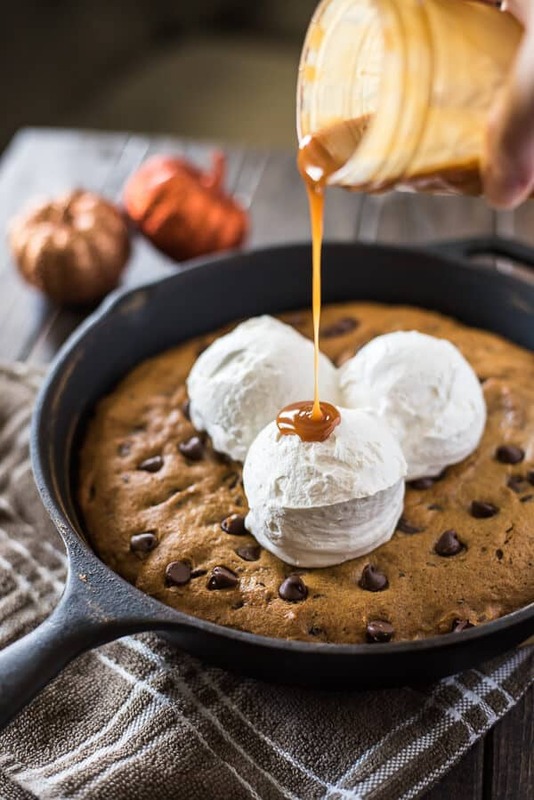 Adding pumpkin and spices to classic cookie dough bakes up a soft, chewy cookie that you're gonna need a plate for! Blend in all dry ingredients, mixing until just combined. Fold chocolate chips and chunks in gently with a spoon or spatula. Transfer dough into 9-inch cast iron skillet, spreading it to fill the space evenly. Sprinkle additional chips on top for looks. Bake for 18-20 minutes, or until the edges are puffy and the middle of the cookie is just baked. Remove from oven and allow to cool for a few minutes, then slice, serve, and enjoy with a big scoop of vanilla ice cream! Looking for more quick and easy skillet recipes? Look no further than this compilation from the #SundaySupper Tastemakers! Sautéed Gnocchi with Pomodo Crudo by What Smells So Good? Can I just have a slice right now?!?! This looks divine! I’ve been baking with pumpkin all weekend! 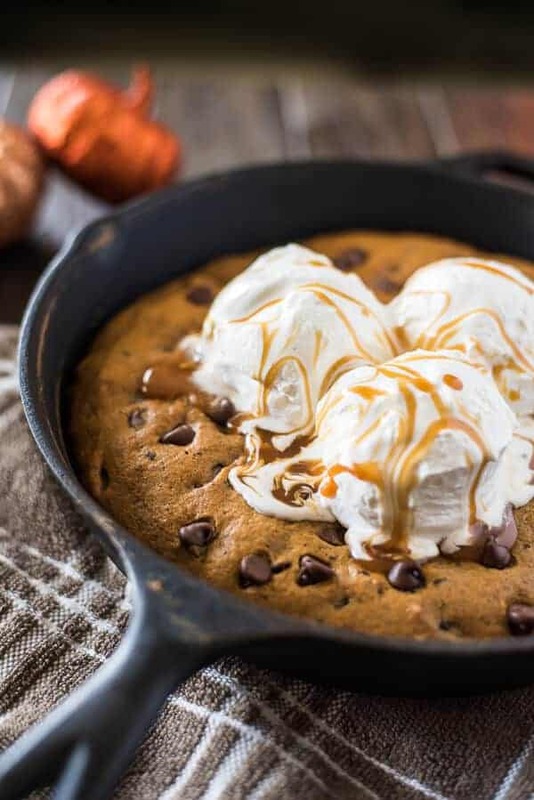 This skillet cookie looks awesome! I hope you saved a slice for me!!! I’ll take mine with a scoop of vanilla and a generous pour of that caramel sauce!!! YUM! Love your image of the Pumpkin Spice Fairy! And this pumpkin loving Ninja Baker is saving (and hopefully making soon) your scrumptious skillet cookie! Well YUM……I wish I had thought of this for Pumpkin Week. Oh well, I will just have to make it anyway.